Chop most of the strawberries and mix with part of the sugar in a large bowl. Cover with plastic wrap and refrigerate for at least 2 hrs., then blend with an immersion blender. Preheat the oven to 180°C/360°F. To make the cake, separate the eggs. Mix the butter, part of the sugar, egg yolks, vanilla extract, half of the milk, and part of the strawberry puree. Then sift the flour, baking powder, and salt into the wet mixture and combine. Add the remaining milk. Beat the egg whites and gently fold them into the mixture. Divide the batter between three equal-sized baking pans and bake for approx. 20 min. To prepare the Pimm’s mousse, soak the gelatin in a part of the Pimm’s. Put a third of the remaining Pimm’s in a saucepan. Use a toothpick to mark the height of liquid in the saucepan. Bring to a boil, add the remaining Pimm’s and sugar, and simmer to reduce to a third (the syrup is done when the reduced liquid reaches the height of the marked toothpick). In the meantime, whisk part of the heavy cream until stiff and set aside at room temperature. Measure out the cooked syrup. If not enough liquid, add some strawberry puree to it. Add hot syrup to soaked gelatin and whisk slowly until gelatin is dissolved. Then whisk on high speed until the mixture is foamy. Set aside and let cool down to room temperature. Zest the orange and the cucumber. Cut the remaining strawberries, orange, and cucumber into small pieces. Chop the mint. Add a third of the stiff cream to the Pimm’s-gelatin mixture and whisk to combine. Then add the remaining stiff cream and fold it in with the fruit and cucumber pieces, mint, and zests. 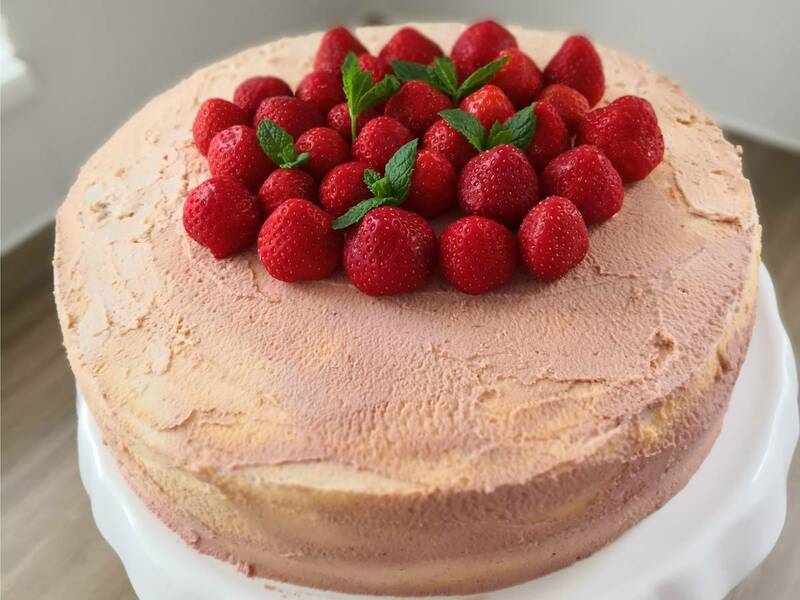 Spread each sponge layer with strawberry jam and then use a cake board to assemble the cake by layering the cakes and the Pimm’s mousse. Start and end with the cake layers. Refrigerate for at least 2 hrs. To make the outer frosting, whisk mascarpone, lemon zest, and confectioner’s sugar, then gradually whisk in heavy cream until soft and spreadable. You can add a bit of red food coloring if you want. Then spread the cake with the frosting and decorate with strawberries and mint. Ready to enjoy!